Penang is considered to have the best street food in all of Asia, Lonely Planet, the New York Times and countless other publications have rated it in their top 10 lists. After five days trying to eat our way through as much of it as possible, I would have to agree, food in Penang is fantastic! 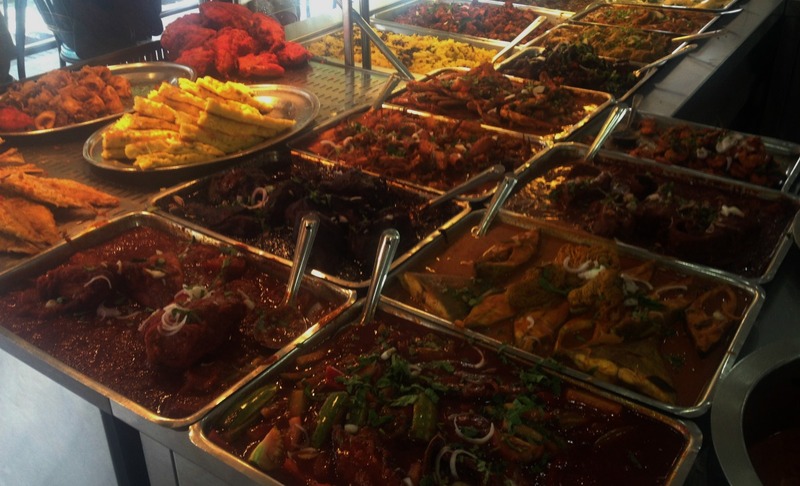 Finding the best places to eat in Penang. Our week-long visit to Penang was part of a four-week Asian eating extravaganza that included Kuala Lumpur, Singapore and Langkawi. Penang did not disappoint. If you are heading to Malaysia and are not planning a stop in Penang, you might want to reconsider. Penang is a fascinating city with a vibrant art scene, including some fantastic street art and more than enough history and attractions to entertain you for several days. We had to stay that long to try all the great foods we had read about. Below you will find a few of our favourite meals and a bit of a reading list to help you prepare for a foodie holiday of your own in one of my favourite cities in South East Asia. We are drawn to street food when we travel and found the choice of food on offer by the street vendors or hawkers in Penang was outstanding. We ate most of our dinners on this trip in these centres. They offer lots of choice, great fresh food and sometimes even ceiling fans and entertainment. Two people can eat well at a hawker centre for $15, and you could easily get by on less if you didn’t overindulge as we usually do! We visited Red Garden on our first evening in Penang. I had read about it on various travel forums, and while I thought perhaps it might be a bit of a tourist trap, it was an easy option after a long day travelling. Well, this was one of those times that the hype was warranted, it turned out some of the dishes we ate here were among the best we had all week. So much so we ended up returning here on our last night. You will find Red Garden just a short walk from the stunning Blue Mansion, my favourite building in Penang and one you really should not miss! What to order: The Char Kway Teow, BBQ pork, and the fried squid were fantastic here. This centre was at the bottom of our street, we discovered it on one of our early morning walks, and it’s size alone caught our eye. It also looked spotlessly clean, so we immediately added it to our to-eat list. It is also one of the few centres that are open all day (10am-1am). We had a great clay pot chicken here, and at RM6 it was a lot cheaper overall than the other centres. When we returned home, I realised it was the first place Anthony Bourdain had visited in his Penang episode of No Reservations. I was a little disappointed because I thought we had uncovered something of our own! CF has live entertainment (and televised soccer games), and the crowd was mostly local even a few years after it gained Bourdain’s attention. Where: 448-58, Gat Lebuh Armenian, Georgetown, Penang – It’s opposite Chew Jetty. What to Order: The clay pot dishes here were particularly good and not readily available in other places we ate so it’s a good spot to try them. Not quite a hawker centre in that it is not undercover, so really it’s just stalls on the street. I liked the atmosphere at New Lane; the hawkers were very friendly – their little booths looked super clean, and it was a great people watching spot. Unlike the two centres above it is not air-conditioned, has no entertainment and no shelter but the food was delicious, and the local crowd seemed to be regulars. We had a great wonton noodles soup and some excellent fried oysters here. They also do a great seafood Chay Keow Teow. Lucky for us some of our favourite food bloggers had visited before we did so we had some tips to follow, and the rest of the time we led our noses take the lead. It took us a few days to manage breakfast because we found after all our nightly hawker feasts because we never woke up hungry. After a bit of research on the Chowhound website, I settled on yum cha at Tai Tong Cafe. It served traditional style yum cha and seemed kind of busy when we arrived. We wandered in and found a table for two towards the back of the room. Within a few minutes of being seated, an older local gentleman approached us and introduced himself. I thought he must have been the owner. He asked us to join him at his table and share a meal. Sadly the first thought I had was… hmm is this a scam. Thankfully we decided to go with it and had one of the best meals and conversations of our entire trip. He ordered dishes from the menu for us that we would never have discovered alone and told us tales of his many years of world travels. Favourites here were their handmade noodles, the little silver bowls of glutinous rice cooked with chicken and black mushrooms and the egg tarts of course. Our host was fascinating and generous and had more vitality than most 30-year-olds. I hope we can dine with him again one day. Tek Sen was another restaurant I added to our list from my extensive blog reading. I am so glad I did. It turned out to be our best restaurant meal in Penang. The signature dish double roasted pork lived up to its reputation as being worth travelling for. I usually avoid fried food, but this was amazing. We also had duck cooked in beetroot that was fantastic and my stand-by eggplant cooked dish anyway, here is it with fermented bean paste. Like many Penang restaurants, Tek Sen offers dishes in 2-3 sizes, by sticking to small meals we were able to try much more than we usually could in a western restaurant. If you arrive here to a queue, I suggest you wait. They will give you a menu to look through and take your order before you sit. By the time you are at your table, your food is on its way. Our first breakfast in Penang was at this Indian restaurant. Smoke from the tandoori oven was pouring out of the footpath vents. The smell was so good we could not walk past without stopping. So tandoori chicken for breakfast it was, served with some steaming hot roti and tea talk. The tea was about the only thing in Penang I didn’t like. It is so sweet they may as well call it sugar tea if you don’t have a sweet tooth stick with the lemon tea or lime juice. Nasi Kandar, which is rice served with a variety of curry-based dishes, originated in Penang and reminded me very much of dining in a school cafeteria only thankfully much tastier. Throughout our week we kept walking past restaurants with windows full of curry and fried chicken and other interesting looking morsels, but it always seemed too hot to be eating such heavy food. One lunchtime we decided it was now or never and ventured inside. After telling the owner, we were new to Nasi Kandar he promptly started showing us all the options. To be honest, he lost me after the first three explanations, so I just ended up pointing at something with chicken and something with chickpeas and the lamb. It was all fantastic. I wish we had tried it earlier. We did need to go home for an afternoon nap after all that heavy food, but it was delicious! There was so much amazing fresh fruit it was the main dessert we ate. I loved the bright pink dragon fruit which seemed to brighten up every dish. I also loved the little fresh fruit stalls that lined many of the busy streets. Individual bags filled with freshly chopped fruit, environmental factors of all this packaging aside this was such a great snack option and so much healthier than the quick fixes people eat while out and about at home. The king of Malaysian fruits is the Durian and while Charles is usually a brave eater the smell of this apparently tasty fruit has put us both off trying it. Maybe next time we are in town we will give it a go. This was the one dish we ordered everywhere we went. 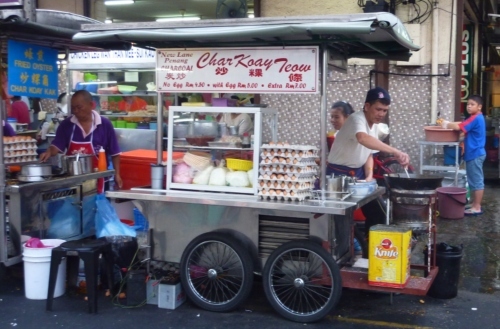 Char Kway Teow (CKT) is almost considered a national dish in Malaysia. The literal translation is “stir-fried rice cake strips” it is basically rice noodles, light and dark soy sauce, chilli, some belachan (fermented shrimp paste), whole prawns, cockles, duck egg, bean sprouts and Chinese chives. While all of these ingredients are important the key to a good version is how it has been cooked. Achieving the perfect charred aroma that comes from cooking the dish over the perfect heat without burning it is what separates a good Char Kway Teow from an excellent one. We had some very very good versions in Penang, but it was the dish that we ordered the one from a small stall on Chulia Street just called the Char Kway Teow Stall. We ate all of the meals above in Georgetown where we stayed. I loved this area, it was very walkable, and there was plenty to see (eat) and do all around us. We kept meaning to get out to the beach areas to dine, but we walked so much eat day we pretty much stuck to the area near home in the evenings. No matter where you stay. 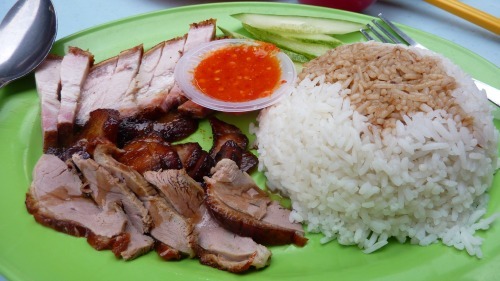 If you love food, you will love Penang. I promise. If you prefer someone to help you discover the foodie delights of the city you might want to check out this tour. Have you been to Penang? Do you have a local favourite to share?